Yesterday's Homily focused on the gospel (MK 4:35-41). Specifically the part about being still. When my boys were little, there were times when I just wanted some quiet...and for them to be still. There were times when I thought it would be nice to be a nun so I could have some peace & quiet. Just being still is one of the hardest things. I have so many things running through my mind, even when I try to be still and just be. 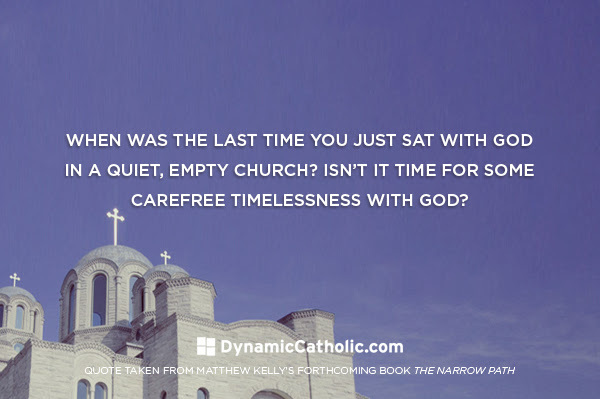 There have been many times I've sat in the Adoration Chapel and tried to push things that need to be done out of my mind. Usually starting with prayer helps, but even then there are times when I'm so distracted that it's hard to even do that. What do you do to quiet yourself so you can hear what God is trying to say to you?